Okay kids, get ready for an entertaining, witty post full of funny tales and cliffhangers that will leave you laughing and fully entertained. This is one of those boring detailed posts but one you just can’t skim over. Because I am going to teach you how to not only save loads of money but also loads of time. 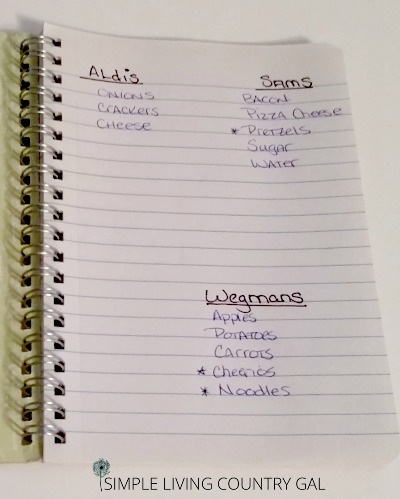 I am going to teach you the art of making an insanely effective grocery list. When most folks visit the store, they are there just to grab a few things. A gallon of milk, some bread and maybe a box of cereal for the kids. As they walk down the isles, items begin to magically make their way into their shopping cart. They do a mental check of their pantry at home and put in a few boxes of pasta just in case they are out. Soup, salad dressing, cheese. Oh, look, a sale on chips. Let’s get a bag or two since we are here. Before they know it, they have a full cart and are faced with a $115 bill. Out comes the credit card for this unplanned purchase and not another thought is made. It’s only food after all and we all need to eat, right? The worst part is, once they are home they realize what they bought, they had plenty of. And even worse, they are still out of spaghetti sauce that they totally forgot all about. To me, there is nothing worse than wasting time and money all in one shot. Okay, let’s fix this, shall we? I keep an ongoing list on the front of my fridge at all times. Everyone in the family knows if it’s not on the list it will not get bought. Do not be tempted to skip this step. I don’t care how good you are, there is no way to make an effective list in 5 minutes before you run out the door. Remember the trick is to be thorough. Every little thing needs to be on the list. Ninja Tip: Get into the habit of adding items before you run out. If you get into this habit you will never run out of something again. Remember to include your spices, baking ingredients, mixes, and any paper products like foil and parchment paper. A thorough list is the key to this all working. Treat this list like it is an extension of your home and always visit it as a reminder that it is there. Another tip is to write how many you need. Our goal is to decrease how many trips we make to the store. If you want to save money…stay out of the stores. Such a simple and super effective tip!! So, if you drink a lot of coffee let’s say, don’t just write down “coffee” but instead write down “Coffee-2 bags“. Be thorough so you remove the guesswork come grocery shopping day. Break your list down by store. If you are like me and do your shopping at more than one store, then break your list down by store to keep things efficient. I use a small notebook to hold my final list. This book is perfect since it has pockets for any coupons I need. By listing items by the store I can get in and out quicker with fewer distractions that may cost me money. Another tip to an insanely effective shopping list is to use coupons wisely. I like to put an asterisk * next to items that I have a coupon for. One asterisk for each coupon so, let’s say I have 3 coupons for an item I will simply put 3 asterisks. I do this same tip for online coupons as well. Remember, there is nothing worse than going to all the trouble to find those money saving items, the trick is to do whatever you can (old school or not) to remind yourself of them. As I buy the items I move the coupons from one pocket of my folder to another. This way once I get to check out I can just grab those coupons and know that the correct items are in the cart making for a smoother (and quicker) checkout. 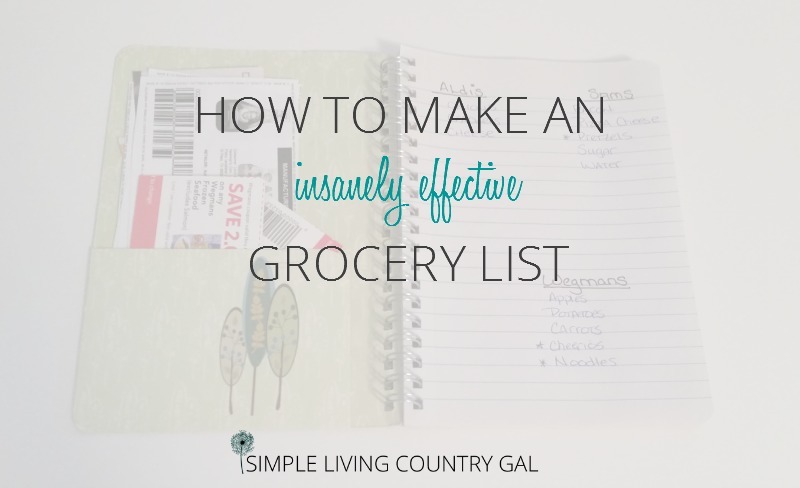 Now, I see you rolling your eyes, but this post is titled an Insanely Effective grocery list and if you want insanely effective, take a few minutes to make a menu. Did I really just say a few minutes? I sure did. It takes me just 10 minutes to make a weekly menu and 20 for a monthly. If you have never made a menu, read my post here on how. Once you have a menu you will know exactly what you need and how much, keeping you on track and on budget. This is my game changer tip. Most of us are not new to shopping so we pretty much know what is where in the store. Make your list in the order (or at least close) to which isles they may be found in. This will one tip alone will cut your shopping time and distractions in half. If you are new to shopping most stores have the same layout. Produce is first, with meat, dairy along the outside. The interior houses your canned goods, cereal, baking, pasta, drinks, and snacks each in their own isles. At the very least get like items listed together until you get the feel of things. I just love this tip! More stores now have the option to order online, pay, and even choose your pick up day. Imagine shopping from your recliner and stopping at the store only to find your groceries all bagged up and ready to go. Some stores will even load them for you. If you don’t have this option at your local grocery store you can find most groceries at Amazon.com. This one can be a bit tricky to get used to. My advice is to keep track as you go. Most cell phones have a calculator which really helps. Simply type your final budgeted amount into your phone’s calculator. Then as you shop just subtract out the amount as you go. this will help you to stay on budget. I know another obvious point, but you would be surprised how NOT doing this tip can be a time waster. Once it is crossed off the list it is done and you can move on more easily to the next item. You would be amazed at how things can get lost on a list when you are not crossing off as you go. Ninja Tip: If you forget a pen ask to borrow one at the service desk. They are usually pretty helpful if you ask. A silly simple tip that can save more time than you think. There you have it, my old school yet incredibly helpful tips on how to make an insanely effective grocery shopping list. If you follow these tips you will not only cut your grocery time in half but never run out of items again. I know some of you are electronic list makers and I applaud you for it. I, on the other hand, am old school. I need paper and pen in hand to be efficient. The most important thing is to find what works for you and use it. If you make it complicated you will not do it, trust me on this. Keep it simple, keep it efficient and use all the time and money you save on bigger and better things. Hi Tracy! I have to chuckle at your grogery list on the fridge! This is how I did it when my (now grown with kids of their own) kids were youngl. I always told them to put it on the list. If it was on the list, I would buy it. If it’s not on the list — too bad. I did the same thing with activities. I had 4 kids and I did daycare. We were always on a tight schedule. I bought one of those big desk top calendars each year and put it on a wall in the kitchen. This became our “Grand Central.” There were 6 lines for each day of the week — enough for each member of our family. Everyone had a line. If it was on the calendar, we did the activity. If it wasn’t, too bad — you don’t get to go. All softball, volleyball, dance, music lessons, etc (as well as family vacations and doctor appointments) went on the canendar. It worked very well for our family. As my kids grew older and went off to college and had their own apartments, I bought them calendars for Christmas. All the family birhday’s were on the calendars, as well as family dinners/holidays, etc….. One year my then 34-year old son didn’t remember we were having a family dinner (even though I had told all of them!) and didn’t show up (because nobody bought him a calendar for Christmas!). Needless to say, I have not missed a calendar gift to him since! Now, two of my daughters have children of their own, and guess what they give me for Christmas every year?!! This is almost exactly what I do, and it works so well… I don’t do the cash or menu planning, but the notebook? 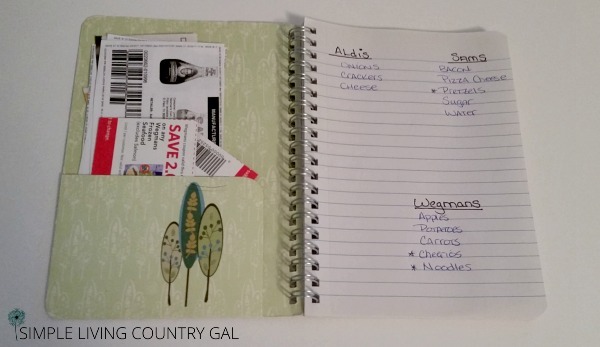 Writing the list well before, sorted by store, IDing which you have coupons for, etc….? Lifesavers! I do a big shopping trip once a month as well, and only top off perishables like milk and bread as needed..I actually note coupons, rebates, etc, on the list as well, since I use rebate apps. And price matching! I don’t know if that’s available where you are, but it is, selectively, here.. So I mark that down beside the item, on the list. It all works together. Looks like we both think alike. I have met very few monthly shoppers so I really enjoy it when I do. Isn’t it the best time and money saver? I have friends that shop every Saturday and I just don’t understand why they would want to do that. I totally forgot about price matching, yes we have just a couple that do but I like to take advantage whenever I can. I have not used a rebate app, I will have to check that out…thanks! What about produce? Do you buy that once a month too or do you make trips for fresh produce? Just curious! To go once s month would make my life much easier! Yes, I also only purchase 90% of my produce once a month. We eat the produce that will only last a week or so first, then finish with the rest. Bananas we store in the refrigerator, yes the skin does brown up but they are just fine and not overripe at all. I have learned that staying out of the stores saves me the most money not to mention time. I have been monthly shopping for almost 10 years now and I am able to feed a family of 6 for less than $500 a month including pet food and paper supplies! I have a series coming soon on how to monthly shop. If you sign up for my email you will get notice when it is ready to go. Like minded we are re: it goes on the list the minute I see we only have one left, different store lists, marking items that have a coupon (i even write the expiration dates to remind me). Items that are duplicated each month are already on each list by copying from the templates I created. Anytime we need to purchase inbetween monthly I send my hubby as he sticks to the list items only much better than me. 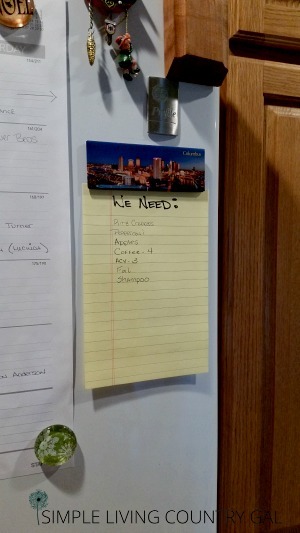 I’ve set-up a header list on the fridge using correction tape. Each of the 3 grocery stores are listed, then there’s the 4 TO DO lists – mine, hubby, ours, & long-term goals (like empty change each day to our vacation jar). Under each header is a magnetic pad of paper to write what’s needed. We sit once a week to review & edit. 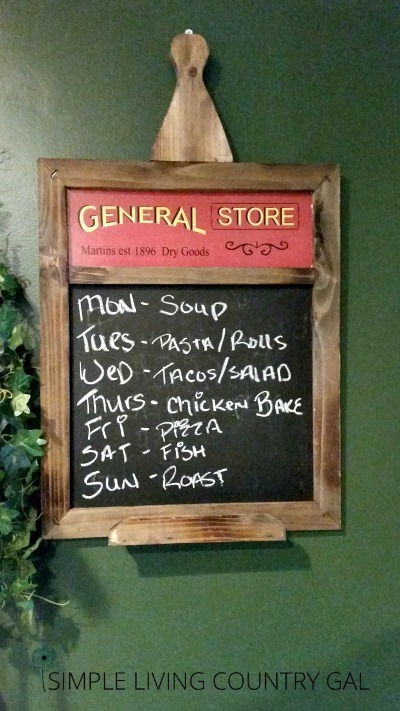 And decide from our pre-printed post-it nites what meals we like fir that week. We also have a bit of competitve streak as to who crossed off the most from their TO DO list and have silly wagers to make it fun. I like the “gift calendar” that someone posted about as well. On my xmas TO DO list already lol. Oh that is a great idea! Expiration dates for coupons on the list. Love it!! THANK YOU! I Also love my pen and paper! I just recently started putting it up on the fridge. I buy the small yellow pads 3pk at those everything’s a dollar store. 1’s for grocery, ones for housework Todo , need to buy @the grocery , and the 3rd is for my son’s appts and events (he’s nonverbal w Autism) I am a Mom of 4 totally unorganized , not planned , forgetful stay at home mom who hated to throw away anything! Well , Autism has taught me my old ways just do not work! Slowly but surely and proudly I am getting there. I just still was buying what we didn’t need and forgetting what we did need. Main problem I have become so very much better w is FORGETTING MY LIST lol at home. So now I just snap a pic on my phone for just in case. My grandpa always said if you want to remember something right it down. So I keep a post it on door as I’m leaving. Better yet, I bought a bag for his Autism meetings w so and so and I can keep my folder and clipboards in it . I have been leaving an extra yellow pad of paper in bag. This has given me such inspiration tho. Everything has to be so complicated nowadays but your post lured me in and I am so glad. Simpler the better! PS I signed up for your emails I think I may just surprise myself within the next few months . I definitely​ am so grateful to have found your website. I just loved reading your comment, thanks so much. 🙂 It totally made my day! I agree with you completely, things have become so complicated anymore. Keep it simple so it works, that’s my motto! I just love that you take a picture of your list, great idea..going to borrow that one. Here’s another idea: YEARS ago when the kids were little, I painstakingly typed up our family’s food list. I walked around the kitchen, then the pantry, then the bathrooms, etc., and wrote down what we actually like and use. I sorted the items as they are grouped in the grocery store, such as pharmacy, cleaning, pet food, frozen, refrigerated, paper, cereal….you get the idea, In front of each item, I put a little open square / bullet. THIS is what I kept taped on the frig. As I ran out of something, I checked it off. Oh, and at the end of each group, I put a bullet, but then I left the line open in case I thought of extra items that month. It was easy walking around the store, using my own personal food list! Wish I had that budget deal like you mentioned. Always a struggle for me! I will certainly try you calculator / subtraction idea! God bless you, from the Texas Hill Country where it is 96 degrees today! Pray for our country and it’s leaders! Oh I just love this tip!! Thank you so much for sharing!